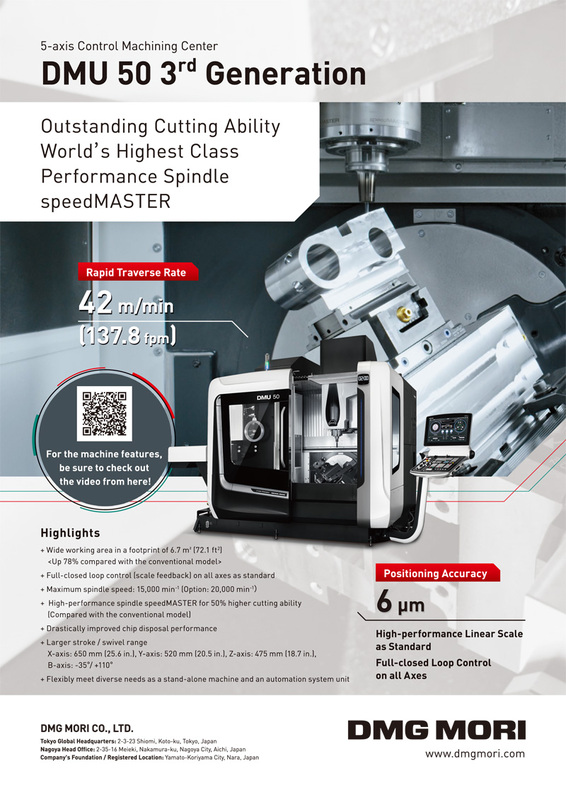 Multi-axis numerical control (NC) machine tools such as 5-axis control machining centers and 5-axis control multi-tasking machines are widely used in machine shops. 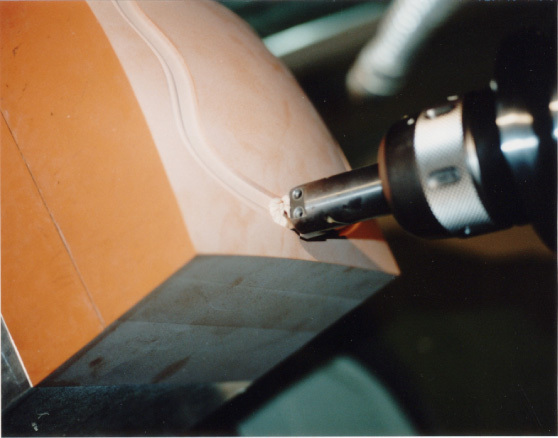 NC data, which are prepared using computeraided manufacturing (CAM) systems, are used with multi-axis control NC machine tools that have a variety of advantages. This article describes the advantages ofmulti-axis control machining. The structure of CAM systems used for multi-axis control machining and the important role of collision avoidance in generating cutter location (CL) data are then explained. The transformation of CL data to NC data for use in machining, which is performed by a post-processor, is presented. Finally, an efficient machining method and unique shape creation via 6-axis control machining are explained. Y. Takeuchi, “Current State of the Art of Multi-Axis Control Machine Tools and CAM System,” J. Robot. Mechatron., Vol.26, No.5, pp. 529-539, 2014. K. Nakamoto and K. Shirase, “Simulation Technologies for the Development of an Autonomous and Intelligent Machine Tools,” Int. J. of Automation Technology, Vol.7, No.1, pp. 6-15, 2013. Y. Takeuchi and T. Idemura, “5-Axis Control Machining and Grinding Based on Solid Model,” Annals of the CIRP, Vol.40/1, pp. 455-458, 1991. T. Lozano-Perez, “Special planning: a configuration space approach,” IEEE Trans. on Computers, Vol.32, No.2, pp. 108-120, 1983. K. Morishige, K. Kase, and Y. Takeuchi, “Collision-Free Tool Path Generation Using 2-Dimensional C-Space for 5-Axis Control Machining,” Int. J. of Advanced Manufacturing Technology, Vol.13, No.6, pp. 393-400, 1997. K. Morishige, Y. Takeuchi, and K. Kase, “Tool Path Generation Using C-Space for 5-Axis Control machining,” J. of Manufacturing Science and Engineering, Trans. of the ASME, Vol.121, No.1, pp. 144-149, 1999. K. Morishige and Y. Takeuchi, “Strategic Tool Attitude Determination for Five-Axis Control Machining Based on Configuration Space,” CIRP-J. of Manufacturing Systems, Vol.31, No.3 pp. 247-252, 2002. M. Morikawa, T. Ishida, K. Teramoto, and Y. Takeuch, “5-Axis Control Tool Path Generation Using Curved Surface Interpolation,” JSME Int. J. Series C, Vol.49, No.4, pp. 1209-1214, 2006. T. Inoue, T. Ishida, and Y. Takeuchi, “Rapid 5-Axis Control Tool Path Generation by Means of Interference-free Space Concept,” Proc. of 4th Int. Conf. on LEM21, JSME, Fukuoka pp. 489-494, 2007. Y. Takeuchi and T. Watanabe, “Generation of 5-Axis Control Collision-Free Tool Path and Postprocessing for NC Data,” Annals of the CIRP, Vol.41/1 pp. 539-542, 1992. M. Sudo, “The Advanced Control Technologies for 5-axis Machining,” Proc. of 12th Int. Machine Tool Engineers’ Conf. (IMEC), Tokyo, pp. 248-257, 2006. S. Takahashi, K. Morishige, and Y. Takeuchi, “NC Data Generation for Five-axis Control Machining Using Curved Interpolation (Application of Five-dimensional Non-Uniform B-Spline Curve),” J. of the Japan Society for Precision Engineering, Vol.65, No.12, pp. 1740-1744, 1999 (in Japanese). K. Konishi, Y. Fukuda, and K. Iwata, “Development of CAM system for 5-Axis Controlled Machine Tool Using NURBS Interpolation,” Trans. of the Japan Society of Mechanical Engineers, Series C, Vol.67, No.657, pp. 1675-1681, 2001 (in Japanese). Y. Tominaga, K. Teramoto, T. Ishida, H. Honda, and Y. Takeuchi, “Curved Interpolation CL Data Creation for 5-axis Control Machining Expressed by Non-Uniform B-Spline,” Trans. of the Japan Society of Mechanical Engineers, Series C, Vol.72, No.719, pp. 2286-2292, 2006 (in Japanese). Y. Ueda, T. Ishida, and Y. Takeuchi, “Development of CAM System for 5-axis NURBS Interpolated Machining (NC Data Generation by Generalized Post-Processor),” Trans. of the Japan Society of Mechanical Engineers, Series C, Vol.75, No.749, pp. 216-222, 2009 (in Japanese). K. Morishige, T. Nasu, and Y. Takeuchi, “Five-Axis Control Sculptured Surface Machining Using Conicoid End Mill,” G. J. Olling, B. K. Choi, and R. B. Jerard (Eds. ), Machining Impossible Shapes, pp. 366-375, 1998. S. Ishizuka, K.Morishige, K. Kase, and Y. Takeuchi, “Development of Tool Grinding System for Conicoid EndMill,” J. of JSPE, Vol.64, No.10, pp. 1456-1460, 1998 (in Japanese). H. Suzuki, Y. Kuwano, K. Goto, Y. Takeuchi, and M. Sato, “Development of CAM System for 5-Axis Controlled Machine Tools,” Proc. 23rd North American Metal Research Conf., NAMRI/SME pp. 187-192, 1995. T. Umehara, K. Nakamoto, T. Ishida, and Y. Takeuchi, “Development of a Process Planning System for 3+2 Control Rough Milling,” Proc. of Int. Symp. on Flexible Automation, CD-ROM (JPL2660), pp. 1-6, 2010. T. Moriwaki, “Multi-functional Machine Tool,” Annals of the CIRP, Vol.57/2, pp. 736-749, 2008. Y. f. Chen, Z. d. Huang, L. p. Chen, and Q. f. Wang, “Parametric Process Planning Based on Feature Parameters of Parts,” Int. J. of Advanced Manufacturing Technology, Springer, Vol.28, No.78, pp. 727-736, 2006. K. Kubota, T. Kotani, K. Nakamoto, T. Ishida, and Y. Takeuchi, “Development of CAM System for Multi-Tasking Machine Tools,” J. of Adv. Mech. Design, Systems, and Manuf., JSME, Vol.4, No.5, pp. 816-826, 2010. K. Nakamoto, K. Kubota, T. Ishida, and Y. Takeuchi, “Development of 5-axis Control CAM System for Multi-tasking Machine Tools,” Proc. of 45st CIRP Conf. onManufacturing Systems (CIRPCMS2012), Athens, pp. 266-270, 2012. K. Nakamoto, D. Hamada, and Y. Takeuchi, “Development of CAPP System for Multi-tasking Machining of Complex Shapes,” Proc. of 6th Int. Conf. on LEM21, JSME, Matsushima, SD-Card, pp. 527-530, 2013. Y. Takeuchi, M. Sato, and H. Suzuki, “New Concept of Machining by Means of Six-Axis Control,” Annals of the CIRP, Vol.43/1, pp. 341-344, 1994. F. H. Japitana, K. Morishige, and Y. Takeuchi, “6-Axis Controlled Ultrasonic Vibration Cutting in Fabrication of Sharp Corner,” Int. J. of Advanced Manufacturing Technology, Vol.21, No.8, pp. 564-570, 2003. F. H. Japitana, K.Morishige, and Y. Takeuchi, “6-Axis Control Cutting of Overhanging Curved Grooves by Means of Non-Rotational Tool with Application of Ultrasonic Vibrations,” Int. J. of Machine Tools & Manufacture, Vol.44, pp. 479-486, 2004. F. H. Japitana, K. Morishige, and Y. Takeuchi, “Highly efficient manufacture of groove with sharp corner on adjoining surfaces by 6-axis control ultrasonic vibration cutting,” Precision Engineering, Vol.29, pp. 431-439, 2005.